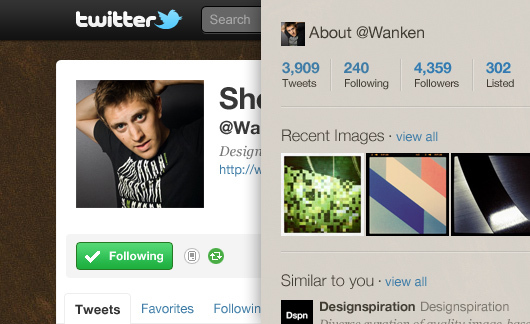 Twitter Background UI Photoshop PSD | Shelby White - The blog of artist, visual designer and entrepreneur Shelby White. Updating your Twitter profile live is silly. Change, save, refresh. Change, save, refresh. After searching thoroughly for an alternative to editing live, it was clear that there weren’t any great solutions or intentions by anyone to create a pixel-perfect template for anyone to use. Not to mention, a template that would stay up-to-date as the website evolved. This PSD includes grouped elements by name respective of their location in the html of Twitter.com. The profile images utilize smart objects to ease the pain of changing images. Update the image once and it will proportionally scale the images across the whole PSD. This template was built closely to Twitter’s current layout as of August 2011. You can download this template below. Please share the PSD with others. Hope this template makes mocking up your profile a lot easier, enjoy! Great .psd Thanks for sharing! This is awesome man! Thanks. This is great , on my imac it was a little off but that was my error. Thanks man! Man, this could have saved me so much time. The Twitter design settings are a nightmare to use. Thanks! How did you know I was looking for one of these? Thanks! @Bruce — I couldn’t find a template that was up to date with the newest version of Twitter so I went ahead and created it because I knew others could also use it. Wow, thanks. This is a great help! Thanks a plenty, I’ve just opened up a new twitter and was getting annoyed at constantly re-aligning and uploading into twitter…only to have it out of place…again! Life saver. Thank you very much for your hard work. You really have taken the sting out of the Twitter design tail. I have just made a quick Twitter background to give it a go and I was very pleased that you had everything placed in the PSD file just so. It made all the difference. When I have more time I will make another background. In the meantime, I was able to make a very quick test Twitter background design thanks to you. I’ll finally have my twitter profile whipped into shape thanks to your template ! Brilliant template, thank you for taking the time to create this. I’ve been looking for this for a while and you’ve saved me the hassle of creating it myself. This is great …..you are a rockstar! Thank you a lot!! It looks great! Thank you very much, great template. This is sweet! Thank you for making this template! Now it’s more convenient to create Twitter backgrounds!